Ecofoot.fr : The FBA, la nouvelle fabrique des hauts dirigeants du football mondial? 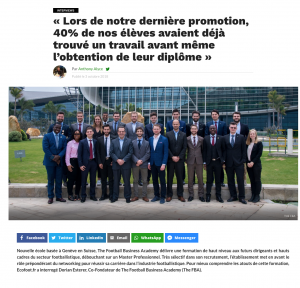 « Lors de notre dernière promotion, 40% de nos élèves avaient déjà trouvé un travail avant même l’obtention de leur diplôme ». 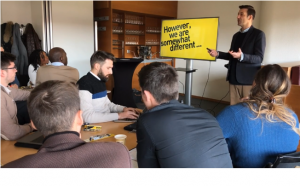 The launch of the The Football Business Academy (FBA) has opened an exciting new channel to careers in the world’s biggest sport and promises to raise the bar on professionalism, ethics and best business practice. 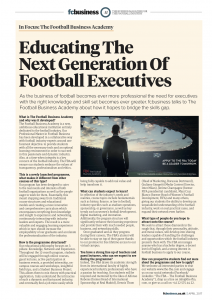 As the business of football becomes ever more professional the need for executives with the right knowledge and skill set becomes ever greater. 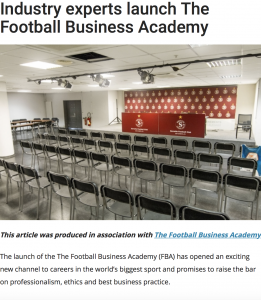 fcbusiness talks to The Football Business Academy about how it hopes to bridge the skills gap.